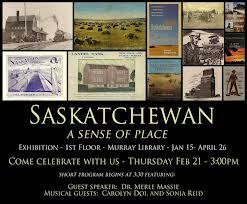 On February 21st, 2013, I was invited by the University of Saskatchewan Archives to be the guest speaker at their Saskatchewan: A Sense of Place exhibit. Located in the annex between the main Murray library and its north wing, the exhibit showcased Saskatchewan novelists and writers, a selection from the extensive postcard and poster collection, and a fantastic display of Saskatchewan local history books. As the guest speaker, I had my choice of topics — but for me, it was simple. My MA work, back in the distant past, studied Saskatchewan local history books and I had a ball regaling the audience with backstories of mice, murder, and mayhem (the stories that didn’t make it into the history books — and why!). It was a hugely successful event and I enjoyed the beautiful music provided by Carolyn and Sonia, to round out the afternoon. In September 2013, I accepted an adjunct faculty position with the School of Environment and Sustainability, University of Saskatchewan. Think of it as an ‘association’ or perhaps an ‘affiliation’ if the term adjunct is too weird. What it means: we have a formalized relationship, where I have a home University base at the U of S, and can advise or mentor students whose projects fit well with my own research strengths. October 23, 2013 saw me troop back to the U of S campus to visit with students from the new Interdisciplinary Learning Communities group at the U of S. (Find them at http://www.usask.ca/ulc/lc/about). Along with soil scientist Terry Tollefson from the College of Agriculture, we hosted an open forum on “The Future of Farming”. The session was live-taped, and when the link becomes available, I will post it HERE. (That could take some time — bear with me!). Learning Communities coordinator Joel Fonstad said afterward, “we’ve never had so many questions!” What will the future of agriculture look like? Three thoughts from my corner were: increases and market gains in the farm to fork movement; increased growth in Hutterite colonies and perhaps a lesson there in how agriculture will look; and some thoughts on climate change and the pole-ward progression of farming. It was fun, as a historian and active farmer, to let my thoughts fly forward instead of backward, projecting toward a future that will — yes– bring change and growth and difference to western Canadian agriculture. The following is a blog post I wrote for ActiveHistory.ca. It was cross-posted to The Otter, a blog for NiCHE (Network in Canadian History of the Environment). Links to those posts: http://activehistory.ca/2013/01/water-stories/ and http://niche-canada.org/node/10556. Water wells up and flows across the landscape of my memory as a cataclysmic force, ebbing and flowing through my earliest life story. Those encounters shift the flotsam of my perceptions as an environmental historian, shaping the way I think about water. And, these stories require sharing, as they differ radically from that of colleagues raised in urban environments where drinkable water flows under, around, into, and out of every home. My family’s first farm house, purchased in the early 1970s, did not have a bathroom. Our toilets were the classic outhouse, and a metal five gallon pail with a toilet seat lid tucked strategically behind the furnace in the basement, next to a holder for the toilet paper. It was Dad’s job to haul the honey pail up the stairs every day and dump it in the bush. There was a base efficiency to that daily routine, though, that belies its yuckiness. Humans use bathrooms. Every day. What innovations –– in fertilizer, in composting, in sanitation –– would we create if each household was responsible for managing their own eliminations? The bathtub was a huge galvanized steel contraption placed under the stairs in the hallway when it came time to scrub up four kids and two adults. Bucketed full of water, Dad plugged in a special water heater that looked to me like a metal foot. My job was to move this contraption every few minutes to different spots in the tub, to ensure even heating. As the youngest kid, I often had the privilege of first scrub in the warmest and cleanest water. But with all the work that went into hauling and warming the water, you can be sure that it cleaned more than one body. Efficiency, thy name is sharing. When I was five or six, we moved in a much larger farm house, one with a bathroom. This necessitated massive renovations, including digging a cistern –– a huge holding tank for water, dug under the new verandah. While water could now gush, flush, and rush out of taps, we still had daily water concerns. Cisterns do not fill themselves. Our water came in summer from the Garden River (which conveniently flowed through our farm land), pumped by Dad via a snake of black pipe. Tadpoles and the odd frog came too, but they never survived the bleach bath: gallons of bleach poured into the water to stabilize it and kill some of the germs. In winter, water became an expensive commodity, brought to our farm and pumped into the cistern by a water hauling truck. Living off a cistern creates an instant water shortage. Each drop translated into either time or money. Wasting water was not an option. Mom invested in a SudSaver washing machine and a laundry tub, saving wash or rinse water to use over again. We continued to share bath water –– Who’s next? Who wants my water? was the holler from the tub. And there is an old saying enshrined on the walls of many a bathroom in rural Canada: “if it’s yellow, let it mellow; if it’s brown, flush it down.’ On a farm, you knew the provenance of every drop, and you knew where it was all going. Grey and black water mixed in the sewer holding tank, which was pumped out regularly to some far corner of the yard. Cistern water was for baths and flushes, dishes and clothes –– but not for drinking. As in our pre–bathroom days, drinking water did not come out of the tap. There was a pail of fresh soft clean drinking water, with a dipper, in the kitchen for general use: teapots and coffee pots, thirsty kids, boiling potatoes, and making juice. We hauled that water from generous neighbors lucky enough to own ‘good’ wells, or from the nearest village where water was treated. On our current farm, the worth of water remains, and responsibility rests squarely on us. The well and its pump are monitored and maintained, the sewer lines checked, the reverse osmosis system (which purifies the well water for drinking) flushed and cleaned and kept in working order. There is always a back up of drinking water stashed away. If something goes wrong, it is our job to fix it, or find a way to live with or without it. My water stories feed my imagination of our collective Canadian future: a cistern in every house; tap water clean enough for flushing and washing, but a separate system for drinking; innovation in black water reuse; and finally, a new universal maxim: running water, and (even more so), drinkable running water in everyone’s home is not a ‘right,’ or even a given. Access to clean water, yes. But modern city standards of drinking water flowing from every tap have skewed our perception of how water ‘should’ be delivered to all Canadians, and of what quality, no matter where they live. It is an unsustainable, and untrue, perception. If water was part of our everyday chores, responsibility, and routine (instead of an unthinking part of our day managed by someone else, delivered to our taps and whisked away when we’re done with it), water would once again be worth its weight. And its value would be true. I find myself caught quite often in a war of words between my academic colleagues and all my friends/neighbors/family who live and work in the ‘real world’ far outside the university walls. What university colleagues consider ‘well-written and accessible for a broad audience’ my Mom will put down in frustration as academic gobbledegook, not worth her time. Sometimes, in the silences of the night when I’m trying to bridge this gap with my own work, I have a vision of the ‘ivory tower’ of the university campus complete with moat, drawbridge, and scary crocodiles in the water, waiting to rip my flesh from my bones, should I decide to take a swim on a hot summer’s day. The walls are high, and I cannot climb over the top. I must pass over the drawbridge and through the door to enter. There are passwords to get into this ivory tower. And they are complicated, scary, and change every few hours, depending on who might be the gatekeeper. You don’t want to know what I said. But I’ll bet you can guess. It didn’t work, so I tried again. ‘HEART ATTACK’ I cried, my eyes on the eyes in the water, slipping closer to the edge. Well, it worked, but the welcome was grudging, at best. He saw my desperation, but clearly my translation left much to be desired. Another day, there was an English professor at the door. She was reading a book in one hand, and working on her laptop on the other. Aha, I thought. I am in luck. In the dusty bottom of a drawer, I have a certified English degree. This will be easy! I tried: ‘Jane Austen!’ No luck. Well, I’m Canadian. So I’ll try: ‘Lucy Maud Montgomery!’ Nothing. She looked up and said, “It is ‘Constructive post-postmodern psychocritical phenomenological narratology,'” you dunce! First, my apologies to anyone who studies what I just wrote. I honestly thought I was making it up. I took out an old copy of Modern Criticism and Theory from my said university English days, and looked up random words. True enough. I am. I hold a nice, fresh PhD that my History supervisor assured me did not get handed to me wrapped with bubble gum. I worked for it. That’s true. But I am unwilling to shake years of writing for public audiences — newspaper articles, newsletters, corporate books, magazine stories. It is a different dynamic, and a powerful one. I’m married to a smart, successful, well-educated scientific farmer. But if it starts with the word ‘post’, and I can’t pound it into the ground, it just isn’t useful. So, I was grateful and happy to see the Dean of Arts and Science at the University of Saskatchewan recently declare that he would ideally like to see U of S faculty “consider communicating their research to the public.” Superb! I agree! (For his post, see http://artsandscience.usask.ca/blog/archives/148). With those thoughts in mind, I was pleased to attend a recent workshop on Communications with Meagan Hinther, word scribe of the School of Environment and Sustainability. My own workshop, Hooked: Writing for a Public Audience stands firm within a movement, almost an insistence, that as prestigious as peer-reviewed academic publications are, there is another audience out there who deserves attention. I was delighted with the uptake for the workshop. We discussed audience, active voice, opening lines, planning with vision, and working with media relations. I have a number of ideas of things we can do better and differently when I offer the workshops again — practical, hands-on writing work. A messy, ugly, trial-by-fire approach. I’ll be the first to get burned, I’m sure. I need several drafts of each email and I still end up with typos and wordy paragraphs. Like this one. The thrust to work toward greater public communication is, I believe, soaking the ground underneath the battlements of the ‘ivory tower.’ The walls shouldn’t crumble, and I really don’t want them to. But I would like to see the doors at least open to the courtyard. Smiles of welcome and recognizable passwords (heart attack, thank you) will be a part of the process. Invite people in, by being inviting. As I said to those who attended the writing workshop, what is more important: sounding smart, or having people understand what you say? Am I knocking academic scholarship? No. There are amazing people and intricate, excellent, technical, and immensely important research problems being studied at every university. Some of that research is complicated, difficult, and best discussed among an intimate group of people who communicate using acutely sensitive and particular words that carry specific and crafted meaning. If it’s necessary to solve world peace or find a cure for cancer or develop policies around safe drinking water, then we need it. And I support it. True. But then again, it is peer-reviewed. If it gets read — and that is easily tracked — it is reviewed by your public peers. Comments, questions, concerns, re-tweets, links… connectivity and sharing are the new way to pass notes down the aisle. That public audience carries enormous power, both in what it can do and what it can say. Endowments, trusts, chairs. Research funding. Partnerships. Community engagement. These are actions, not words, and they are words that every university sits up and pays attention to. I think that in our new era of blogs, Twitter, and ever-increasing connection (Open Source! ), it is critical that academics are encouraged, supported, and promoted in their public writing. Because otherwise, like I saw in a post on Twitter this morning, it is a ‘nerd loop’ where we academics only speak to each other. I admit it: I am an odd academic. When I have a great idea for a story or some new research to share, my first instinct is to find a way to craft it for a public audience. Colleagues somtimes raise their eyebrows — public writing, no matter how much you do or if it is successful, will not help you achieve tenure. Only peer-reviewed chapters or articles in books or journals will help you achieve tenure. But help is at hand. Following a rather cataclysmic shift in the ivory tower (take a look — I’m sure it moved several feet closer to the ‘public’! ), I feel a sea change. Academic writers are looking to make their work more accessible to a public audience. What’s more, universities are starting to realize that fewer and fewer university students will spend their careers working in universities. So, teaching students to write ten page papers, complete with footnotes and a bibliography may be a good starting place, but it does not prepare them for ‘real life.’ Reports. Public presentations. Media releases. Newsletters. Memos. To capture that energy, I have organized a one-day symposium for the School of Environment and Sustainability at the University of Saskatchewan, and opened it up to graduate students and colleagues in several related departments. The result? A capacity crowd registered to attend an all-day session built to encourage an appreciation of good writing in general, and writing for a public audience in particular. I’m grateful to my NiCHE colleagues for starting me out — I have been lucky enough to attend similar conferences through NiCHE, and they were superb. And, I have snagged some big guns to come out and help me. Colleen MacPherson, editor of On Campus News, leads the pack with a basic writing seminar. Bill Waiser will talk about vision, voice, and crafting a good narrative lead with an arc. I have the tough slot of the day, right after lunch — and my topic is the plain language report. Others might call it the executive summary, or the lay language report. Perhaps a more plodding document, but a good first step in learning to cut technical jargon from your research project. But at the end of the day, we have a treat: Kathryn Warden, director of Research Communications at the U of S, will guide us through media relations, press releases, and op-ed pieces. It promises to be a fascinating day. April 10th, 2012 at 144 Kirk Hall, University of Saskatchewan. Pop by. In the spring of 2011, there was water, water everywhere in western Canada. Amidst the media concern for floods in southern Manitoba and Saskatchewan — the Hoop and Holler break, the village of Roche Percee, incredible damage at Minot, ND — all the water from the entire North and South Saskatchewan River system was heading for The Pas. This wasn’t news — after all, all the water from both the North and South Saskatchewan River system (that which is not drained off for irrigation, kept in lakes behind dams, seeps into the soil or lifts off into the atmosphere) ends up at The Pas. It’s simply hydrology: the two rivers converge into one (east of Prince Albert at The Forks) and, after a brief stop in Tobin Lake, are released by Sask Power from the E.B. Campbell Dam to continue the river’s many winding paths east through the spectacular Saskatchewan Delta and past the village of Cumberland House. The amount of water that flows into the Delta is unstable, and has been since the early 1960s and the creation of what was (then) the Squaw Rapids hydroelectric dam. Whereas prior to the dam, natural flows used to rise in the summer and fall in the winter, the dam holds back water in summer in Tobin Lake. All too often, flow was cut off completely, leading to fish being stranded in puddles in the river, and a probable overall drop in the lake levels at Cumberland Lake. That water is kept at Tobin to be released throughout the winter, providing power when the cold and dark Saskatchewan winters leave us hunkering in our homes, furnaces blasting, lights, televisions, and computers all running. Of course, winter releases carry their own issues: unstable ice development, for example. No wonder the Cumberland House community pushed for years for recompense, and a bridge. But I digress. I was talking about The Pas. In the late spring of 2011, the snowpack in the Rocky Mountains was deep; the water in the rivers running from the mountains, high. The old saying “if the Good Lord’s willing, and the creek don’t rise”, or Johnny Cash’s classic hit, “Five Feet High and Rising” may tell the tale of rivers overtopping their banks — and both give a sense of what the Saskatchewan chose to do in 2011. There was no way that the water could be held back in the reservoirs of Alberta or the Gardiner Dam at Diefenbaker Lake; Tobin Lake, which takes in water from the combined river, was bloated and the dam significantly stressed. Outflow into the Saskatchewan River Delta led Cumberland House residents to ask Ducks Unlimited to open smaller dams to release water strategically throughout the Delta, to ease pressure on their town. But even if water could be moved around Cumberland, at least a little, the RM of Kelsey, along with Opaswayak Cree Nation and the town of The Pas, got it all. 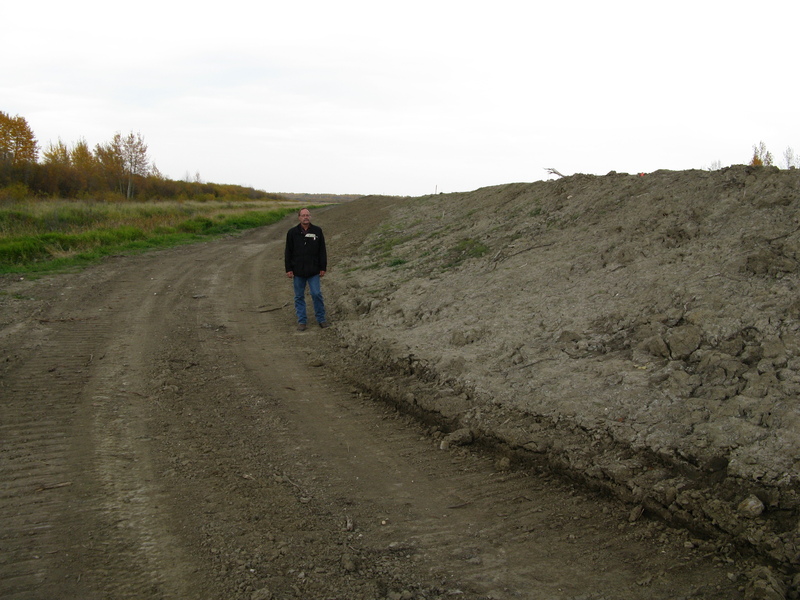 Sitting on a pile of glacial till, The Pas and surrounding area are the drain plug of the ‘bathtub’ of the Saskatchewan River system — all of that water eventually goes through The Pas. To add insult to geographical injury, the Carrot River also empties into the Saskatchewan at The Pas — and that’s where things get really complicated. In a normal year, water coming down various minor rivers empty into the mighty Saskatchewan, which continues its trek through Cedar Lake and the Grand Rapids Dam before entering the Lake Winnipeg water system. But, when the Saskatchewan is bank-full, the smaller rivers — such as the Carrot — can’t empty out. 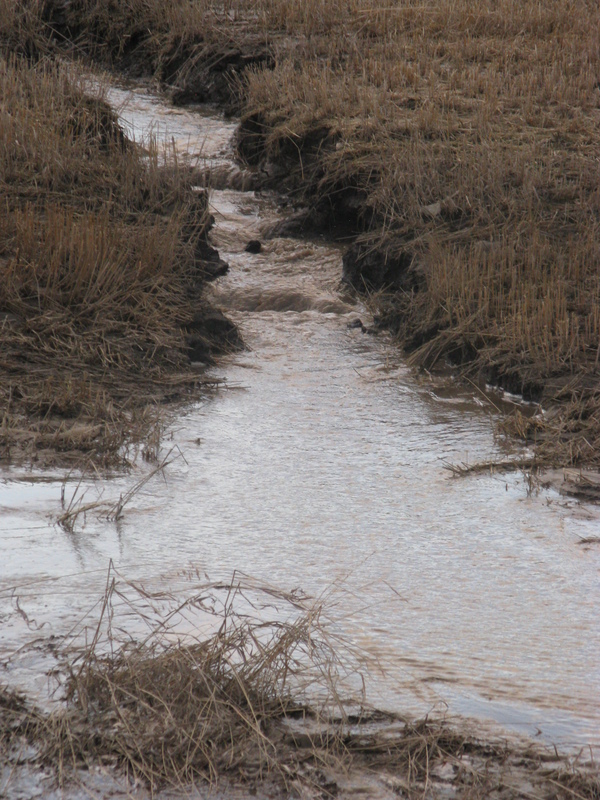 In fact, they back up, threatening to overtop and flood along their banks, backwards from the Saskatchewan. Throughout the entire Delta region, along the banks of the Carrot, the Saskatchewan, and all the other tributaries, the water rose and rose, overtopping in many areas and threatening others. Rall’s Island lies just east of The Pas, nestled in a triangle-shaped bend in the Saskatchewan River. Crossed by channels (both natural and man-made) and old dykes, this is a landscape that is used to being periodically inundated, or at least, threatened by the river. 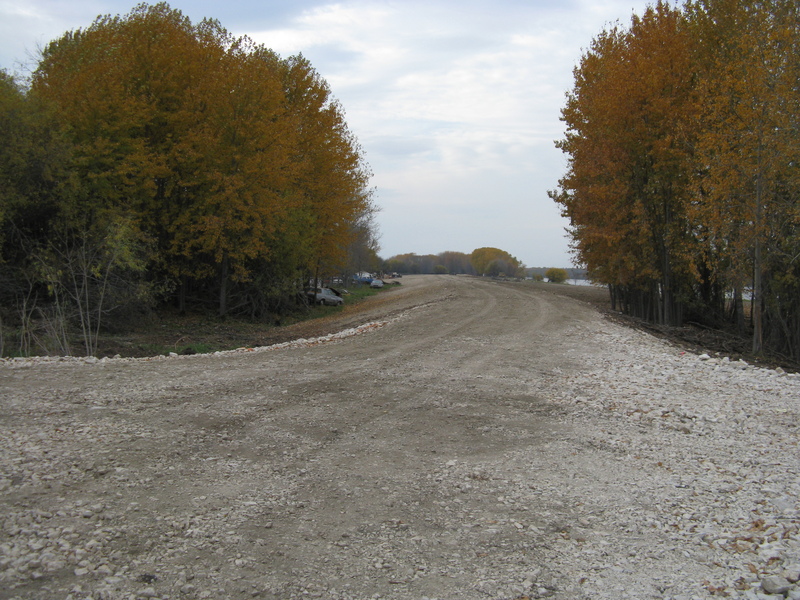 For years, the RM of Kelsey, which governs the patchwork of small farms and acreages that make up the Rall’s Island community, has been pushing for a massive dyke to protect the people and the infrastructure in this vulnerable region. This spring, with the Saskatchewan at 100 year record flood levels, all the pieces fell into place. The RM found a perfect storm of environmental necessity, political and social will, and economic backing to instigate the project. 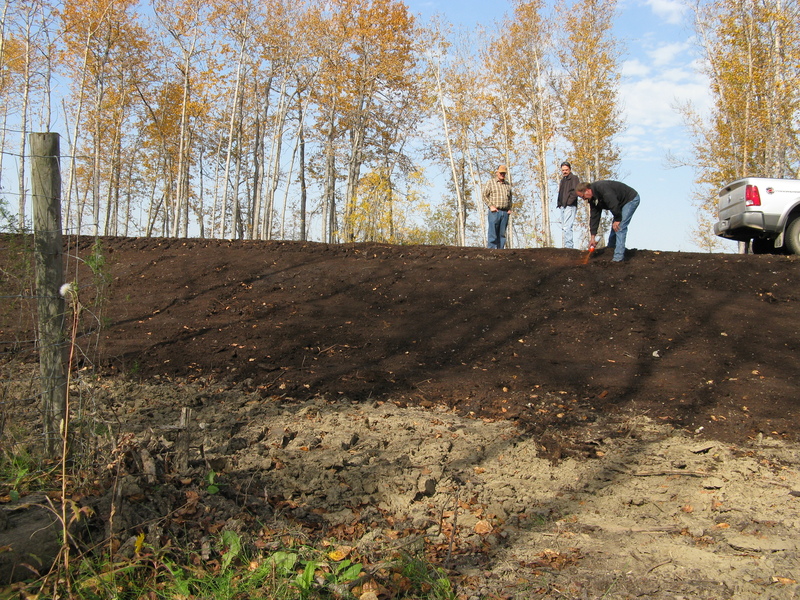 Throughout the late spring and summer of 2011, a massive earthen dyke was created using nearby materials, local and regional equipment and expertise, and plenty of volunteer labour. The structure was more than sufficient to hold back the water. Indeed, standing on it, it seems impossible that even the might of Mother Nature could ever bring anything strong enough to threaten the new dyke. It’s almost a medieval fortification — perhaps their next building project could be a castle, firmly set within the dyke’s ‘moat’! Yet, climate change scientists warn us: it’s not so much that we should expect western Canada to dry up in a drought and blow away (those who survived the flood waters of the past few years would be the first to scoff at such a notion); it’s that ‘the new normal’ is exactly those extremes. Dr. David Sauchyn at the University of Regina, and his extensive research team and collaborative environment, warn: it is the oscillation between extreme wet, and extreme dry, that will be our future. Rall’s Island has one side of that equation covered. We think. Dyke crossing landscape like a road. As a local and environmental historian, my recent visit to Stockholm (via work meetings in Umea, Sweden) was ‘anchored’ by a fabulous visit to view one of the most intriguing historical artefacts I have ever had the privilege of viewing: the seventeenth century Swedish warship, the Vasa. At the height of a massive war between Poland and Sweden (where feuding cousins sat on the respective thrones of each country), the war fleet of the Swedish king was being expanded. At the shipyards in Stockholm, work began on a new ship of war to help fight the naval battles and take troops to and from the scenes of war. The Vasa was built as the crown jewel of this fleet: over 1000 of the King’s Oaks were felled to build the ship. At 47.5 meters long from prow to stern, she carried 64 guns, 145 seamen and 300 soldiers under 10 sails on four masts. Intricately carved and adorned with rich artistic symbolism, she was also richly painted (a detail I hadnt thought of; it seems as though Hollywood’s recreation of sailing ships tends toward the plain, unadorned and unpainted). But disaster struck. As beautiful as she was, she had a major design flaw. Before her maiden voyage, her stability was tested by 30 men who ran in unison across the ship, deliberately checking her balance. After the third run, they stopped, as she nearly toppled and crushed the dock. Despite failing the test, the demands of war pushed those in charge to continue to arm and man the ship. She sailed on her maiden voyage on August 10th, 1628 from Stockholm. A wind keeled her over, but she partially righted and kept going until another wind keeled her over again. This time, water rushed in through the gunports and in front of astonished eyewitnesses, she sank about a kilometer out in Stockholm harbour. An estimated 30 to 50 people died when the ship went down. 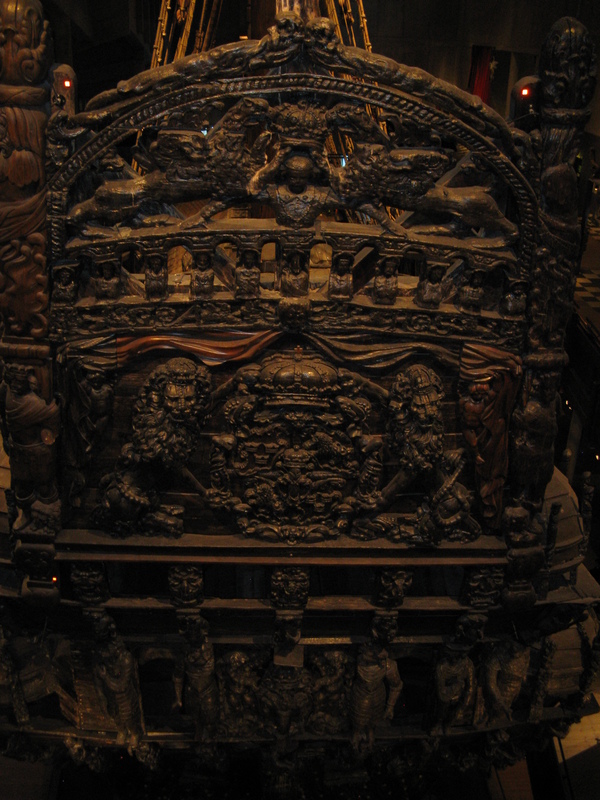 Although partially salvaged for her guns, the Vasa could not be raised. Over time, her whereabouts was mostly forgotten until 1956 when she was rediscovered. What followed was a modern feat of salvage, engineering, and marine archaeology on a vast scale. Vasa had withstood her watery grave remarkably intact: the brackish waters of the Baltic do not host the saline shipworm which feasts on most sunken wooden ships. 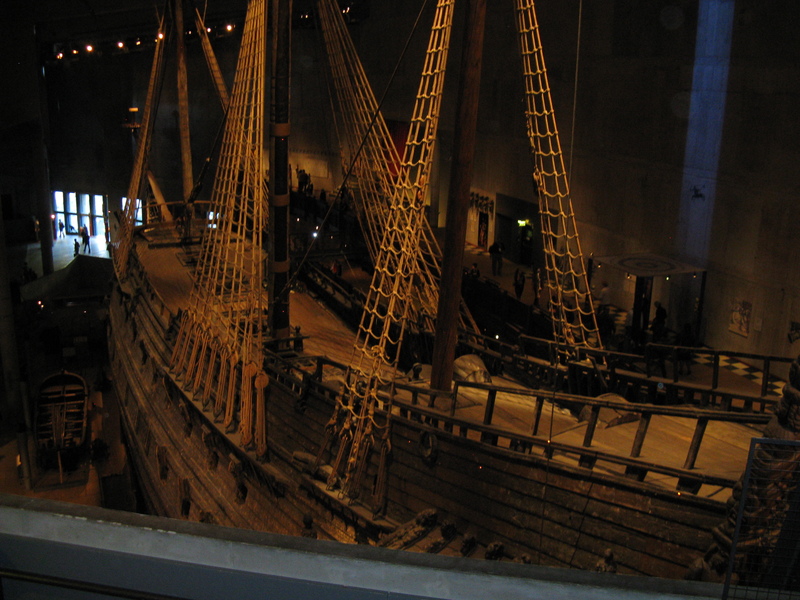 The Vasa could, and was, brought forth from the depths in 1961 to huge international acclaim. Over the next fifty years, she was stripped of the mud, excavated, her contents catalogued and preserved, and the ship’s pieces preserved in polyethylene glygol before being put back together like an enormous jigsaw puzzle. Such a remarkable historical and archaeological find yielded astounding insight into Swedish, Stockholm, and maritime history from the early 1600s, from food to clothing to games to money to health. Now, Vasa can be viewed from her new home on the edge of Stockholm harbor, not far from where she was built and where she sank. And if you’re ever in Stockholm, I insist that you go. It is an impressive sight.